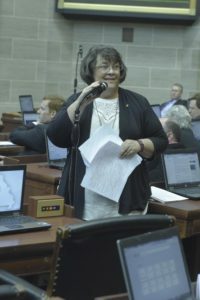 A Missouri state lawmaker who was involved in a head-on collision Monday afternoon on Highway 50 in west-central Missouri’s Syracuse is now listed in serious condition at MU Health Care. The Missouri State Highway Patrol (MSHP) says 60-year-old State Representative Rebecca Roeber, R-Lee’s Summit, crossed the center line on Highway 50 yesterday afternoon at about 12:10, and struck a second vehicle. Roeber was transported to MU Health Care, and hospital spokeswoman Jennifer Coffman tells Missourinet she’s now listed in serious condition. The Patrol says the driver of the second vehicle, 58-year-old Richard Clark of Kansas City, sustained minor injuries. Mr. Clark was transported to Bothwell Hospital in Sedalia. Representative Roeber, who was first elected to the Missouri House in 2014, is in her third term. She chairs the House Elementary and Secondary Education Committee. Missouri House Speaker Elijah Haahr, R-Springfield, made a brief announcement to the Missouri House this morning about the crash, just before Fr. Kurwicki’s morning prayer. State Rep. Chuck Basye, R-Rocheport, tells Missourinet that State Rep. Jered Taylor, R-Nixa, is collecting personal donations of cash or gift cards to assist Roeber’s family with expenses. Anyone interested in donating can call Jessalyn in Representative Taylor’s office, at (573) 751-3833. Donations can also be dropped off at Taylor’s Capitol office in room 306-A.